In an article an anti nuke speaker was stating that remarkably only 4.7 kG of Cesium escaped from Fukushima, and only .75 kG of that landed in Japan. Considering that the original amount of Cesium at Fukushima (this is called the Inventory) was over 3000 Kg, and considering all the explosions and fires, the statement that only 7kG left the plant is on its face just ludicrous. But we can show this with facts very easily. If you grab my inventory calculations from this article, and add the column which shows grams from the upper table, and paste into the lower table next to the Bq/M3, then you can see what the addition of a certain amount of radioisotope would increase the Bq/M3 by. Kenny Boy Buesller said that before Fukushima the average ocean Cesium 137 was around .5 to 1 Bq/M3. Now he is seeing areas that are 4 to 5 Bq/kG, so call it an increase of 4. Got it? So Kenny Boy says it went up by 4, and the full inventory would have raised it by say 17 ( the CS137 plus 25% of the CS134 since 2 half lives have passed), so roughly 4 times more than what we see. So that means about 25% of the inventory is now being measured in the Pacific Ocean. Or about 750 Kg. NOT 4.7 Kg! Let TEPCO be the one lying by a factor of 100, they always do. In fact the only time TEPCO is not lying by a factor of 100 is when they are lying by a factor of 1000 or 100,000. Great article! Thanks stock. Koide is an enigma.. he probably plays the balancing game like Arnie does, is my guess. Hope ur good! Ya thanks, super busy, running out of time on 3 projects all to be done this week, and somehow in a jousting mood. Maybe Koide doesn't share data with Buesseler? Or, didn't think to do this math above? I am too busy to translate this but I have suggestion. For blogposts like this, how about writing a google translate-friendly version using as little idiom as possible, using only super dry non colloquial English so Japanese people might read it too. Just an idea..There has been a lot of cross pollination of info and I hope more happen. Your source term is a gross overestimate. You assume 100% MAR and 100% ARF. Suggest you consider using DOE-HDBK-3010 factors and also consider not all noble gasses were released to the environment. The onsite radiological evidence suggests cosiderable fission products remain onsite. Else what are all those tanks for? 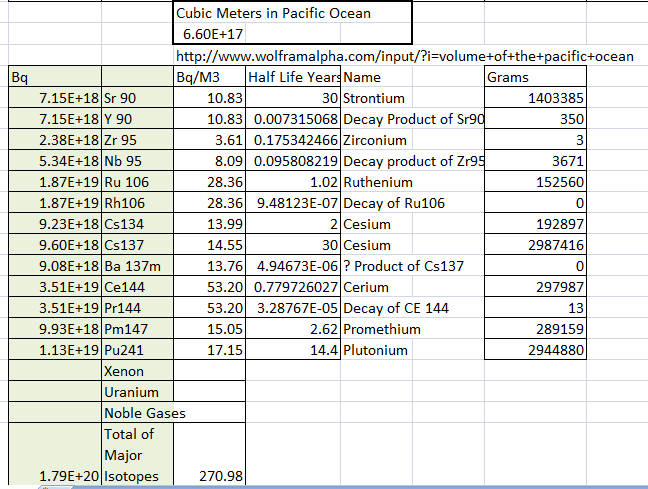 Also in your calculations you missed the ocean inventory of natural uranium and the spontaneous fission yields of those same isotopes. Unless you are one of those types that thinks Sr90 from reactors is not the same as Sr90 in nature. This is the problem with Amateurish analysis using a spreadsheet. Sheesh, the spreadsheet clearly states that we are not even including any noble gases including Xenon. At least read the shite before you come troll here. I did not miss ocean inventory, I am looking only at Cs and its increase in relation to ocean baseline. SR90 from reactors IS significantly different than SR90 from nature, the SR90 from reactors is completely avoidable. You got the call, just the wrong one, like Helen Keller answering the steam generator.